Paul Johnson, the most celebrated popular historian of our time, takes a scalpel to Stalin, whom he considers "one of the outstanding monsters of history." 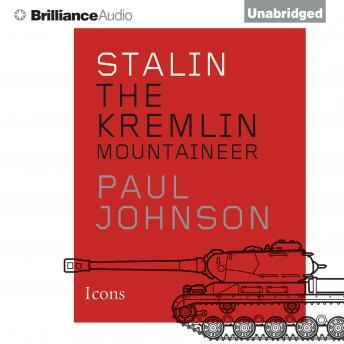 Johnson sets forth the essence of Stalin’s life, character, and career. "It has been a hateful task, which has caused me much pain and disgust," he writes with characteristic candor. "But it has been a duty I have performed not without a certain grim satisfaction." Stalin poses a particular challenge to a biographer: How does one render such a monster human? While Johnson doesn't flinch from chronicling Stalin's rise to absolute power—the remorseless vendetta against Leon Trotsky, the development of the Gulag, the extermination of millions of peasants—he also shows Stalin playing billiards, listening to his adored Mozart, and annotating Marx’s Capital in the margins. It is, in concise form, the story of Russia in the twentieth century: dark and murderous, a stage on which to display humanity's infinite capacity for self-destruction.